The fourth annual L.A. 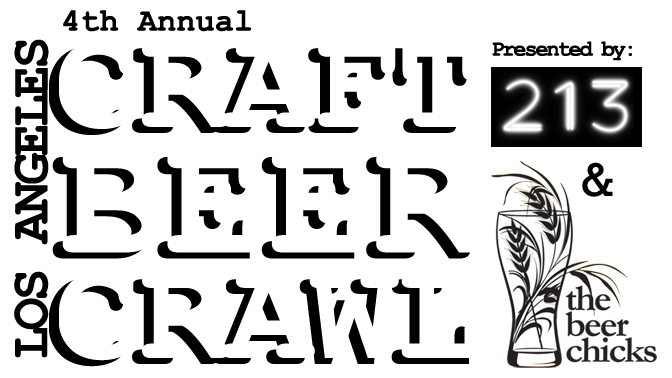 Craft Beer Crawl, a collaboration between 213 Nightlife’s Cedd Moses and the Beer Chicks’ Hallie Beaune and Christina Perozzi, returns to downtown Los Angeles this month. A beer-loving crowd of more than 1,700 people attended last year’s sold-out event, so this year’s crawl has expanded to a two-day festival, featuring more than 100 craft beers at seven bars and restaurants. Ticketholders can sample unlimited tastings at Golden Gopher, Caña Rum Bar, Seven Grand, Casey’s Irish Pub, Cole’s, Las Perlas and Broadway Bar. Beers selected by the Beer Chicks include those from Allagash, Abita, Avery, Bootlegger’s, Brouwerji West, the Bruery, Brewery Ommegang, Cismontane, Deschutes, Eagle Rock, El Segundo, Firestone, Golden Road, Goose Island, Hangar 24, Kinetic, Ladyface, Monkish, North Coast, Noble Aleworks, Smog City, Speakeasy, Stone, Strand, TAPS, Trumer, Uncommon, Valiant, Weihenstephaner and more.